Show videos and presentations in any auditorium with lots of light – in the church, classroom, sports bar, shopping centre, museum, and showroom. Made by Mocom Technology, the largest Korean manufacturer of projection screens; a holder of superior patented technologies. This projection screen is great for big audiences – up to 700 people. Mount the screen on the wall with a wall bracket – very easy, or move it around on a wheeled stand. Watch 3D images and play VR games on a big screen. Get a bigger screen for less money. It is low maintenance and does not consume power. Use in the school auditoriums and business venues. You can leave the lights on and see the faces of the people. No more guessing the feedback from your audience. No more sleepy faces in the dark corners. Show movies and live sports events. Bright projection screen for any venue with any amount of ambient light, from houses of worship and airports to sports bars, hotels, and pubs. Use it in the shopping centre or exhibition hall for demonstrations and advertising. The bright video will showcase your products and tell your stories to make a deep impact on your clients. Replace your screen at home and bring the bright picture into your living room. Your home theatre does not need to be in the dark room anymore – you can leave the lights on. Gain – Solstice™ is an Ultra-High Gain screen. It is 18 times brighter than a standard matte white screen. Yes, this screen has 18 gain. ALR – Solstice™ is an ambient light rejecting screen (ALR) – it only reflects the light from the projector, while the light from the external sources is reflected in other direction (rejected). Brightness Uniformity – This optical front projection screen has over 80% of brightness uniformity, which means an even level of brightness and no hot spots thanks to the concave lens-like precision curved shape. 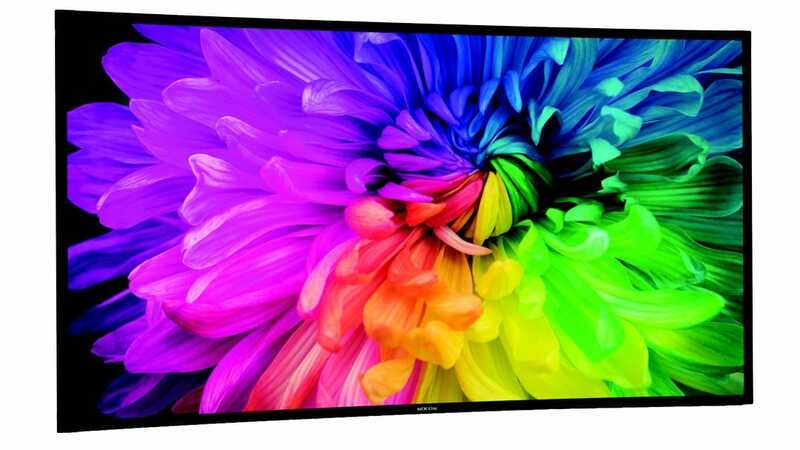 High Resolution – High-resolution capable screen with texture-less surface – use it for 4K and even 8K resolution. 3D Capabilities – Bright projection screen both for active and passive 3D. SolsticeTM is seven times brighter than normal 3D silver screens. Minimal eye fatigue, enhanced 3D effect, no polarization. Matching Projector – Use the screen with the standard or long throw lens projector. No need to buy an expensive projector with high ANSI lumens.